Active case lists detail the number and associated priorities of open active cases. Open cases are automatically escalated according to priority and time since inception. Our help desk software allows your support staff to post actions associated with individual cases. Action lists are used to flag separate activities, and can also be used to carry out tasks at specified times. When customer specific response times are exceeded, warnings are automatically generated and placed on the associated case action list. A separate screen produces a summary of the actions that need to be performed, according to the order in which the cases were received or planned actions should be carried out. When actions are completed, the time and the person who performed the actions are logged. Help desk staff open a new or existing case each time a customer request is received. Each case is composed of the customer details, time and date stamping, flexible case ownership, individual action allocation and customer request details. 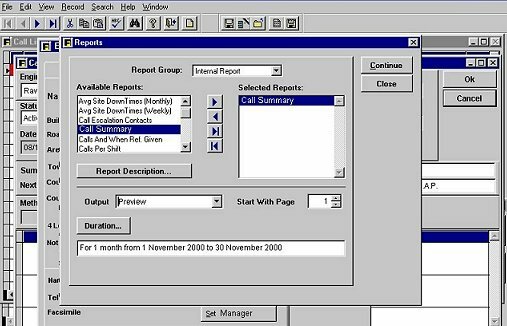 Short-cut menus and automatic text generation built into the system automate support staff entries, focusing efforts on the support needed rather than on data entry. Cases can be easily transferred between shifts and staff to offer maximum continuity. High priority cases can be shared with more than one person working on them at a time. Standard phrases and actions are available to ensure accuracy, and reduce response time by automating the call handling process. Phrase selection is used in several areas where support staff enter specific text information. Whenever a case is updated, the name of the person working on the case, the time and the date are automatically added to the case history. Each time the case is accessed, the total time worked is updated. Reports and billing invoices can be generated based upon the automatic monitoring of time and service support given to customers. 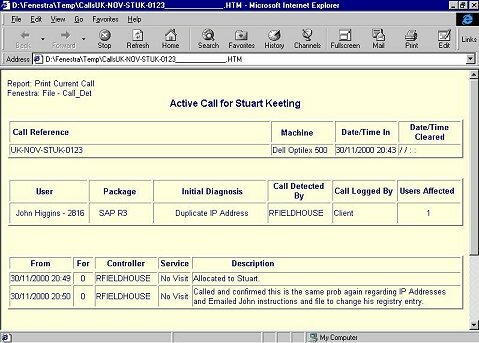 Cases are automatically escalated to specified contacts, using prioritised listing and colour coding. Individuals are notified through the Answerdesk system or by email. For the majority of smaller businesses, a single Fenestra site using a local server will be the best option. This arrangement will support several hundred users with the appropriate hardware. For a business with a large central office and small satellite offices wishing to share case data, the best option would now be to set up a single virtual network using the new technology available with a Citrix / Terminal Server architecture. Networked server solutions also allow remote diagnosis from a dial-in account for service personnel at home or in the field. A business with several large sites or departments can set up linked Fenestra sites. 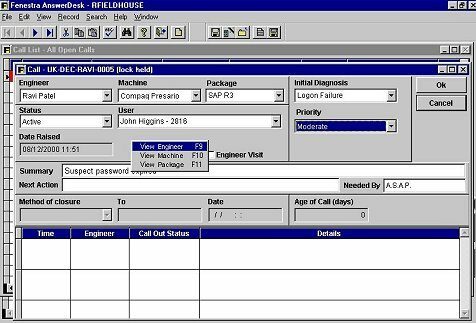 Our SiteLink module allows some calls to be transferred or shared while others can be handled locally to reduce network traffic. This allows a large number of sites to be supported while minimising the site-to-site network traffic. It also allows you to support a "sun-chasing" method of working at minimum cost. In a hosted arrangement, the data and application program are sited at Fenestra's offices and accessed over the Internet. This saves the client the effort of application and server PC setup, maintenance and backup and client PC upgrades. Click here for more information on hosting. The Answerdesk software contains 20 standard reports that can be used by both support staff and management to document success every step of the way. Each report can be previewed, printed or output to spreadsheet or to HTML formats for Internet or Intranet access. These reports can also be scheduled for automatic email delivery to specified individuals. Optional integration with Seagate Crystal Reports adds a further 20 standard formatted reports, and additionally allows you the ability to create customised ad-hoc reports related to your specific business requirements. Full Case reporting, including summaries and statistics on response times, case closure rates and service levels achieved. Unless performance can be measured against fixed objectives, improvements can never be assessed or rewarded. The flexibility of this management reporting tool identifies areas of excellence, as well as those that are problematic. Management information including performance, detection rates and usage levels. Shift handover reporting, displaying active cases and required actions. Customer cases can never be predicted accurately, but over time load patterns do emerge. The Answerdesk software assists you with the compilation of statistics to justify and plan the potential impact of cases during high and low request periods. Allows configurable response times that support staff should take to resolve a case problem, and also displays an elapsed time against the open case. Displays remaining hours of fixed time related service contracts.